The ripe fruit of deciduous arbor plant Melia toosendan Sieb. et Zucc. of family Meliaceae. Big, gold pericarp, yellow-whitish pulp, full and elastic. Bitter, cold; mildly toxic; liver, stomach, small intestine and urinary bladder meridians entered. Move qi and alleviate pain, expel ascaris; kill worms and relieve itch for external use. It is good at soothing liver and alleviating pain and indicated for pain due to qi stagnation. 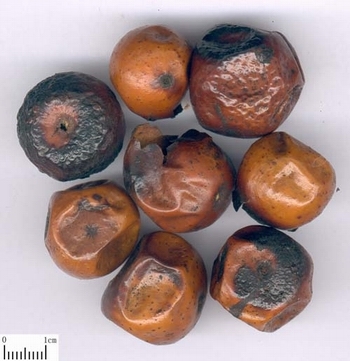 For it also can clear liver fire with properties of bitter cold, it is especially good for qi stagnation syndrome with liver-heat. For this syndrome, it is usually combined with the qi-moving and heat-alleviating herbs. For instance it is combined with Yan Hu Suo in Jin Ling Zi San from Sheng Hui Fang. 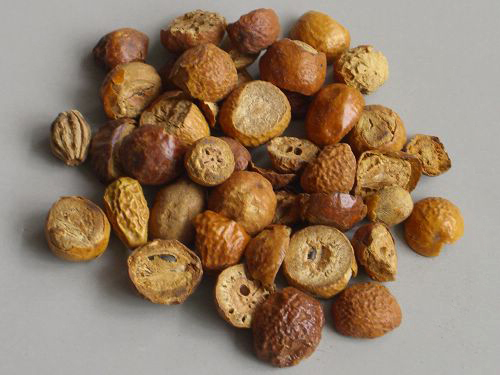 For hypochondriac pain due to liver depression and qi stagnation or pain chest, hyponchondrium, stomach and abdomen, it is usually combined with the liver-soothing, qi-moving and middle-energizer-regulating herbs such as Chai Hu, Bai Shao, Zhi Qiao and Qing Pi. For hypochondriac pain due to the syndrome of liver depression and qi stagnation with blood stasis, it should be combined with the blood-activating and stasis-removing herbs. For instance it is combined with San Leng, E Zhu and Ru Xiang in Jin Ling Xie Gan Tang from Yi Xue Zhong Zhong Can Xi Lu. For orchidoptosis and colic pain due to cold congealing and qi stagnation in liver meridian, it is usually combined with the cold-dispersing, qi-moving and pain-alleviating herbs. For instance it is combined with Xiao Hui Xiang, Mu Xiang and Wu Zhu Yu in Dao Qi Tang from Yi Fang Jian Yi (Concise Explanation of Prescriptions). It can not only expel ascaris but also move qi and alleviate pain. For ascariasis with abdominal pain, it is usually combined with the vermifugal herbs. For instance it is combined with He Shi and Bing Lang in An Hui San from Xiao Er Yao Zheng Zhi Jue. In addition, it also has the actions of killing worms and relieving itch for external use, and indicated for scald head. It should be ground into powder and mixed with cooked lard or sesame oil or vaseline for local application. Decoct 3~10 g, proper dosage for external application. It is bitter, cold and mildly toxic in property, so it can easily induce nausea, vomiting, etc. when overtaken.